Finally I managed to get rid of "watercolor"-looking leaves in videos. 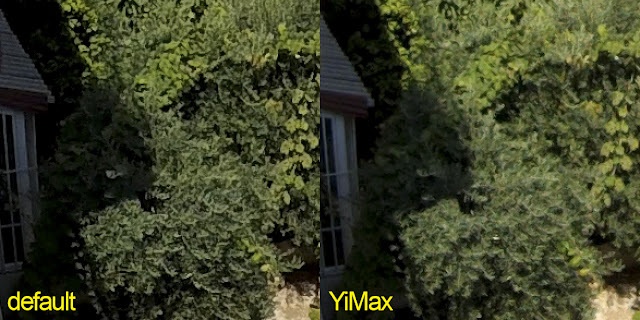 Check for the new YiMax-movie script here. Please leave feedback on using this script. these advanced scripts really get frustrating. then i removed the battery, and put it in again, no change. do you know of any sure way to make it load ALL settings? f.ex. - coring table is ignored most of the time. I set it to 8. as you see in the picture, it is not. I'm not 100% sure, but it seems like some of the settings loaded with ituner are bypassed after camera changes its mode (low/high iso). if your script works for you all the time, can you post some instructions how to avoid the cam ignoring some settings? whether this script, there are settings for manual exposure?